You'll love the convenience and looks of this a heavy duty, field shell goose. Un-matched portability & realism for the price. It was designed with awesome feather detail by an award winning, professional wildlife carver. The standard size Field shells are 21 inches breast to tail and 11 inches wide. 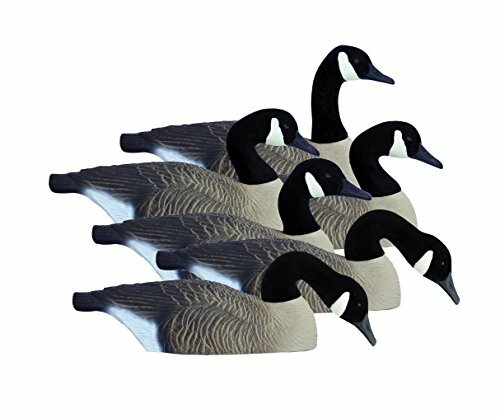 All Canada models come with field tested, durable black flocked heads with white painted cheek patches. Head positions include: 1- Mid Sentry,2- Semi-Feeders, 2-Walkers, and 1-Rester head. This new field shell offers unmatched portability and realism. A percentage of your purchase will go towards wetland conservation. Sold per 6 with flocked heads.